Every week I write about the most interesting new comics hitting comic shops, bookstores, digital, and the web. Feel free to comment below if there's a comic you've read recently that you want to talk about or an upcoming comic that you'd like me to consider highlighting. 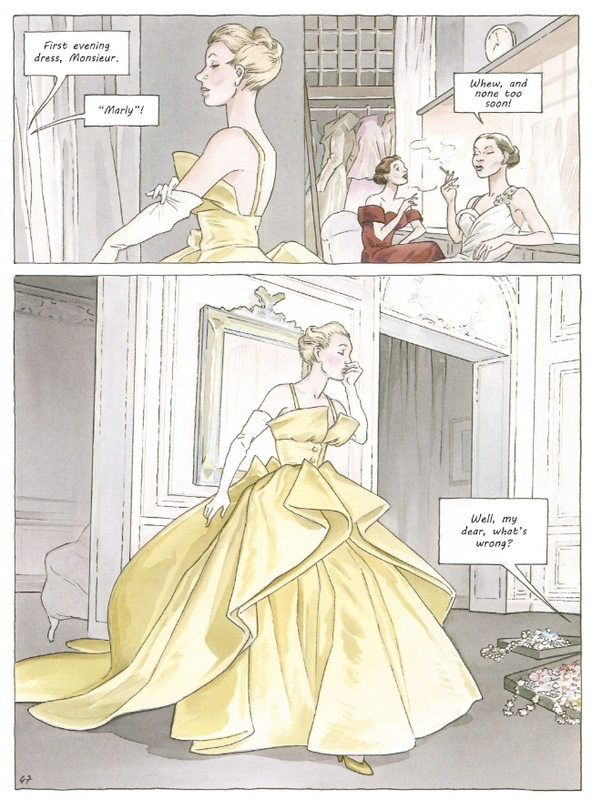 Making its U.S. debut this past weekend at the MoCCA Arts Festival in New York City, Annie Goetzinger’s Girl in Dior is sure to be one of the best looking graphic novels of the year. It's an account of the rise of fashion designer Christian Dior and his revolutionary 1947 fashion show that introduced the so-called “New Look” to the world, a colorful and voluptuous departure from the boxy, drab and way too sensible post-WW II stylings of the day. Goetzinger tells the story through the eyes of a fictional character named Clara who goes from chronicler to model to Dior confidante in the span of the book. 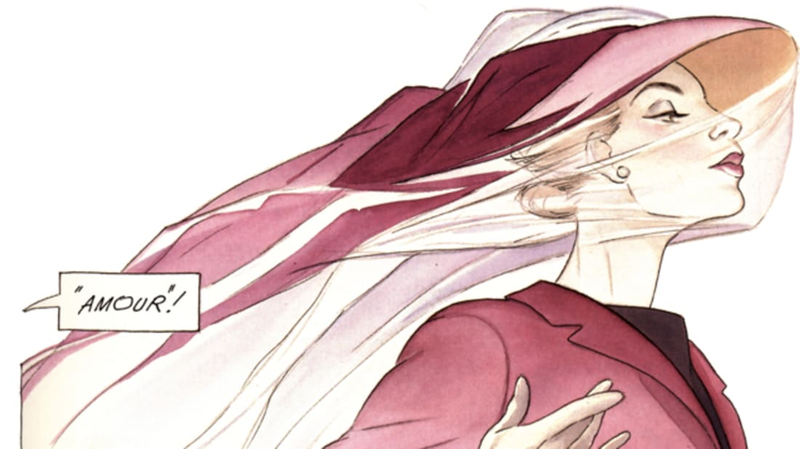 While it is mostly historical fiction, it is also very much a vehicle for the artist to lovingly render and showcase Dior’s clothing designs in gorgeous pencil and watercolors, reminiscent of mid-century fashion illustration. Goetzinger has had a long career in French comics, debuting her first graphic novel, Casque d’or, back in 1977. She has since worked in costume design for the theater and editorial illustration for such French newspapers as Le Monde. Last year she became the first woman to win the prestigious Grand Prix bd Boum for Girl in Dior. This book will be, for most, the first her work is seen in the U.S.
You can read a short preview (and gape at the artwork) here. Chris Schweizer’s Crogan Adventures has one of the most enticing framing devices I’ve ever seen for a multi-book series. Schweizer first sold the idea for the book by creating an illustrated family tree showing members of the Crogan family dating back to the 1700s. 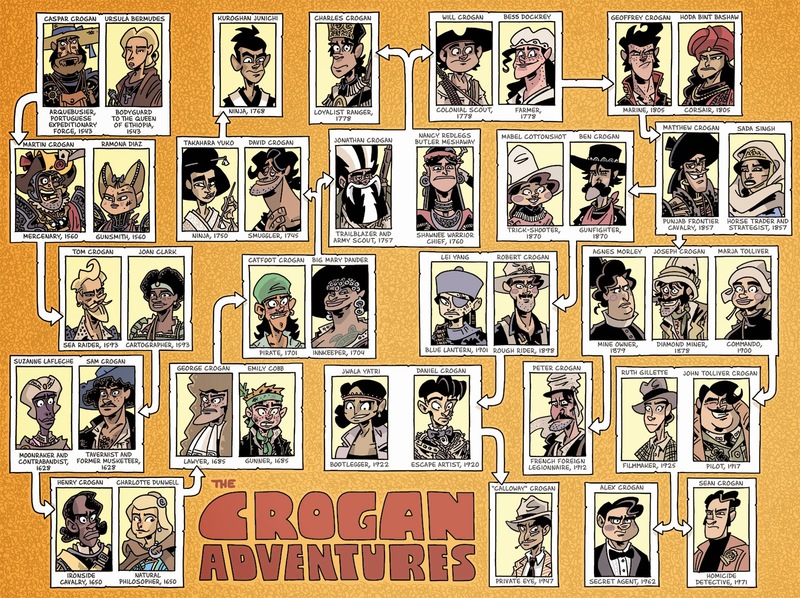 There is a Crogan who ran with the Rough Riders, a Crogan who sailed with pirates, a Crogan who joined the foreign legion, a secret agent Crogan and more. Just seeing the faces and the period-specific garb gives you a hint of the type of story you’d get with each one. Schweizer aims to tell all their stories, dipping his toes in a variety of genres and settings, all full of the kind of pulpy historical adventure that has appealed to young boys for generations. There have been multiple Crogan books since 2008’s original Crogan’s Vengeance, all illustrated in Schweizer's wonderfully fluid black and white brush ink style. Now, he and his publisher Oni Press, are rebranding the books as The Crogan Adventures and re-releasing them in full color. 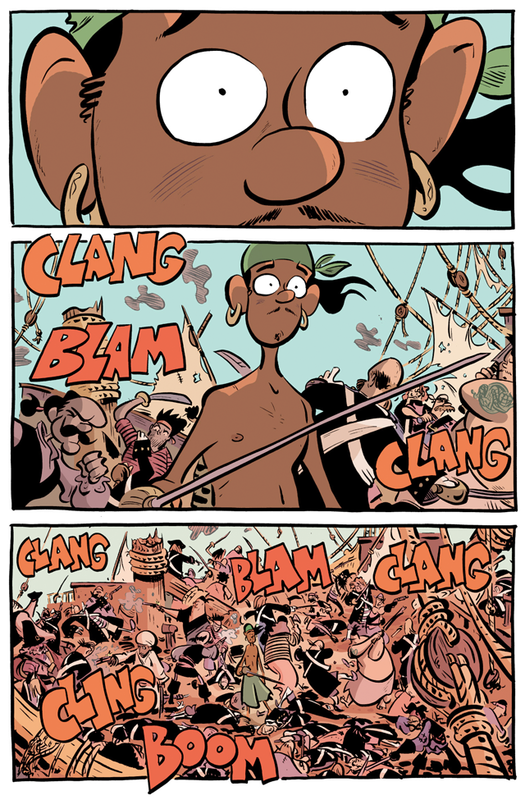 The first book in the new series is a colorized (and also re-lettered) version of the very first book, Crogan’s Vengeance, in which “Catfoot" Crogan gets kidnapped and is forced to join a pirate crew. Since many people (kids especially) tend to disregard black and white books, this is sure to be a good way to introduce these fun stories to a wider audience – especially considering how spectacular the coloring by Joey Weiser and Michele Chidester looks in this preview. One of the best kept secrets in comics is Youth in Decline’s Frontier series, a quarterly, pamphlet-sized anthology comic sold primarily through mail-order. Each issue gives one artist (usually a fresh, up-and-coming voice in the art and comics world) free rein to tell any kind of story they want. The most recent issues have featured rising stars like Sam Alden and Emily Carroll and a future issue will be done by Michael DeForge. 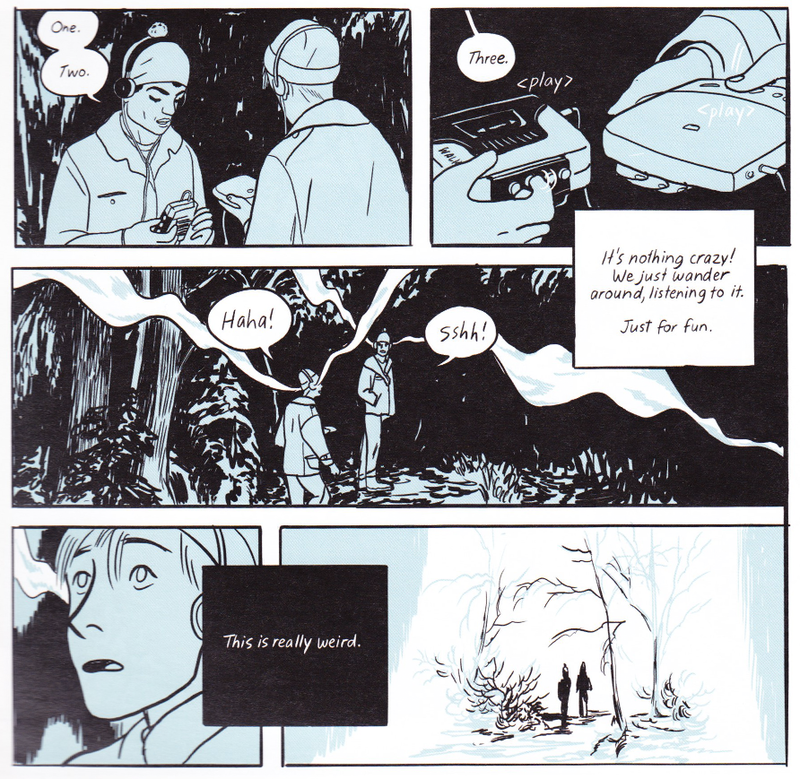 These names bring Frontier out of “up-and-coming” territory and into the world of “well-established-indie-stars.” That includes the contributor to issue #7—Jillian Tamaki—the highly regarded artist behind last year’s award-winning powerhouse of an all-ages graphic novel This One Summer. Tamaki steps away from all-ages comics here (although to be fair, This One Summer deals with some very mature teenage themes itself) with a story called “SexCoven.” Told as if it was excerpted from a documentary, “SexCoven” begins in the 1990s with the legend of an mp3 file that only teenagers can hear and leads to present day and a commune of techies who met online, outgrew the ability to hear that mp3, and dropped out of society altogether. Readers of This One Summer will find a rougher, less delicate style of drawing from Tamaki here, but it is no less effective. Some of her page layouts, in particular, are wonderfully complicated and interesting. You can order a copy of Frontier #6 at the Youth in Decline’s website. The gun-toting Bloodshot is up there on the list of most ‘90s comic book characters ever. First appearing back in 1992, he is an unstoppable killing machine with nano-computers in his blood that help him regenerate from any wound. His government handlers continuously implanted false memories in order to properly motivate him on each of his missions, leaving him unsure who he is and what is real. When Valiant Comics relaunched their long-defunct line of comics in 2012, Bloodshot was front and center with a cinematic and very bloody update to his story. Valiant’s excellent first wave of relaunches is now making way for a second wave which was ushered in by the recent mini-series The Valiant written by Jeff Lemire and starring Bloodshot (among others). The events of that series left Bloodshot with the nannies—and his special abilities—removed from his body, leaving him a regular guy. Now, in Bloodshot Reborn—also written by Lemire—we see him trying to live a quiet life as a somewhat schlubby hotel maintenance man, still very much haunted by what he used to be. However, when someone dressed like Bloodshot goes on a shooting spree, the real Bloodshot needs to find a way to bring himself back into action. Lemire is joined by Philippine artist Mico Suayan who has done a number of covers for various Valiant books in the past. Like any good Bloodshot artist, he brings a gruesome level of detail to the violence, but also a detailed realism to Lemire's solemn, inward-looking reflection on the nature of one’s self. This is a whole new start for Bloodshot and, while the Valiant relaunch is only a couple of years old, it is full of tightly wound continuity that can make it hard to jump into, but this second wave of books is looking to create such an entry point. More than any other medium, comics make it easy for their audience to disrupt the narrative flow on their own—skipping ahead, flipping back, letting the eye jump from panel to panel out of order. 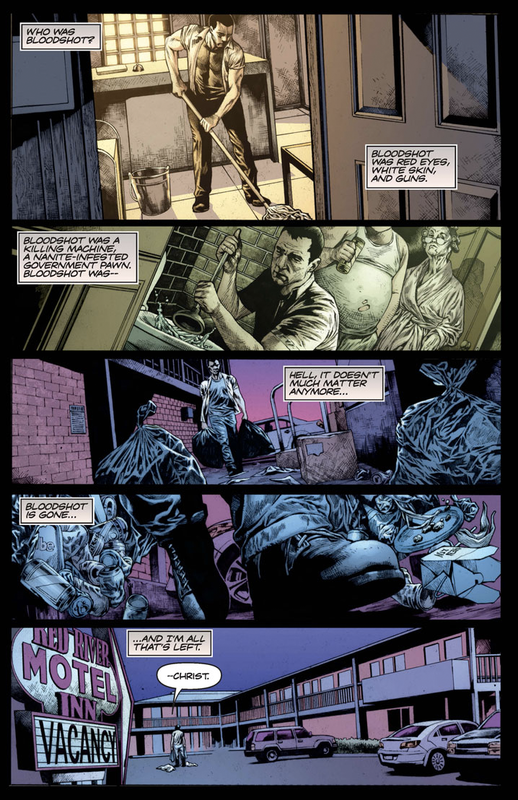 Some writers try to take advantage of this by creating books that can ostensibly be read forward and backward—Grant Morrison and Frank Quitely played with this mirror-imagery a bit in The Multiversity: Pax Americana in mimicry of Alan Moore and Dave Gibbons' "Fearful Symmetry” issue of Watchmen. Cartoonist and comics educator Matt Madden has attempted, as the title Drawn Onward implies, a palindrome of a comic that is meant to be read both forward and backward. 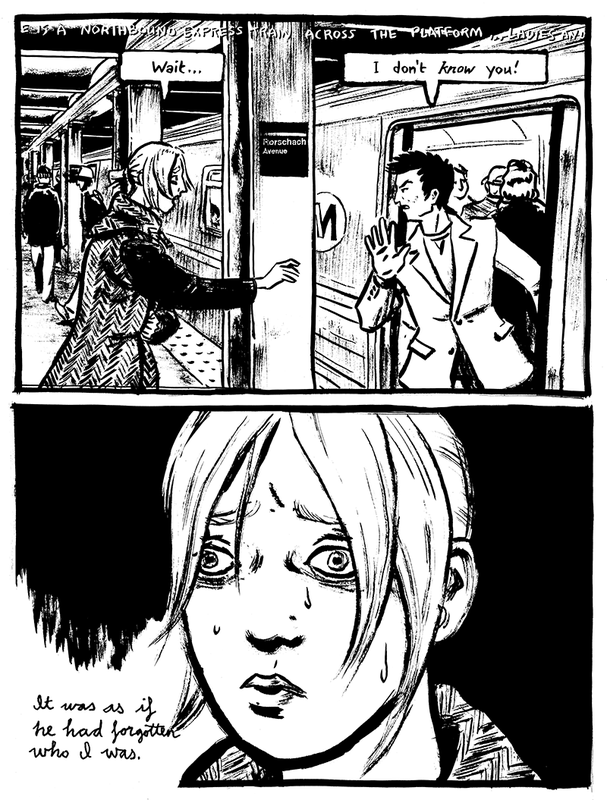 As you read forward, it tells the story of a young woman who is continuously accosted by a stranger on the subway. She quickly becomes obsessed with the man himself. After a double page kiss that spans the midpoint of the book, things change and now the woman is the one obsessed and finds her own advances being shunned. By the end, the woman (who is also the narrator) encourages you to go back and read it the story back to front and see the story play out with her being the seemingly crazy subway person. There are a few layers to what Madden is doing here which encourage you to try to decipher the story: there are implications of a double suicide; he uses two different artistic styles to differentiate scenes between the woman at her drawing board and the subway scenes which seem to be drawn roughly to imply that they are her drawings, and lots of easter eggs like “Rorschach Ave” tipping its hat to the symmetry angle. Reading backwards is a stilted experience that requires a lot of instruction to the reader and seems nearly impossible to truly make the flow of the story coherent in both directions. (Do you read the panels backwards as you would with manga? Just the pages?) In this case, it doesn’t really add to the symmetry you already experience by reading forward, but there is an intriguing puzzle to Madden’s story that will make you flip back and forth trying to work it out. You can order a copy from Retrofit’s store. It’s also available digitally through Comixology.